Book now the best shore excursions in Venice. High quality and safety at the lowest prices. If your are looking for Shore Excursion Venice, book now the best guided tours at lowest price with Ancora Tours. Since 2003 we offer you official guides in english, transportation and travel insurance, all included. The highest quality at the lowest rates. Venice, the birthplace of Marco Polo and Casanova, is universally considered one of the most beautiful cities in the world and it is, together with its lagoon, a UNESCO world heritage site. The venetian carnival is waiting for you in our shore excursion in Venice! You cannot leave Italy without visiting the pearl of Adriatic, the most fascinating city in the world. 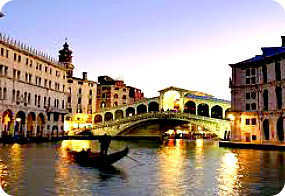 Book now this fantastic guided tour in Venice at lowest price. Just for cruise passengers like you. What’s eating: Sarde in saor: fried sardines with onions, raisins and pine nuts. Sepe al nero: cuttlefish cooked with their ink. Souvenir: Gondola shirt or hat, carnival mask, jewelery with Murano glass. The shore excursion is Venice begins in Piazza San Marco (St. Mark’s Square) where we’ll meet our expert guide. Here, we’ll find St. Mark’s Basilica, one of the most famous buildings in the city. We’ll admire the cathedral from the outside and learn how it was built to house the relics of St. Mark, which were stolen by Venetian merchants in 828. Our journey will continue through narrow streets and small squares, crossing the Grand Canal along the Rialto Bridge until we reach the opera house, Teatro La Fenice. From here, we’ll pass by the unusual architecture of Palazzo Contarini del Bovolo, and into Rialto Market where we’ll get a glimpse of busy city life. A short walk away is Corte del Milion, thought to be the home of Marco Polo. Our Venice shore excursion will continue through the campos San Giovanni e Paolo, a picturesque square, until we again reach Piazza San Marco. The Doge’s Palace was the ancient residence of the Doge of Venice, the leader of the republic, and is one of the most fascinating buildings in the city. After an external visit with the tour guide, anyone who wishes to enter the palace can be a ticket on the day. Otherwise, our Venice shore excursion will finish with some free time in the city. Cross canals and wander through the narrow streets or maybe even take a gondola ride. Our tour guide will leave you with directions to reach the port for boarding.